If you’ve never had Penne alla Betsy, then this is a recipe that you need to try! (By the way, this is a repeat from my blog, and it has been too long since I’ve eaten it…since August 2010!) I made it for dinner tonight because it was quick and easy, and one of my favorites. In addition, last night I had my sister and mom over for dinner and fixed Grilled Tomato Basil Chicken (to be blogged soon) and I had leftover fresh basil, which this recipe calls for. Penne alla Betsy incorporates some of my favorite ingredients: pasta, shrimp, a creamy tomato sauce, and tons of fresh basil. It is so flavorful, and can be prepared and served up within 20 minute. Note: the recipe calls for raw shrimp, but I used cooked shrimp, and did not saute it in the pan for as long…I simply warmed it up. For those of you who have not heard of Pioneer Woman, she is a city girl that married a cowboy, who is referred to as the Marlboro Man, from Oklahoma. 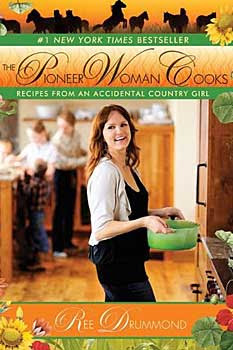 The Pioneer Woman has attracted millions of followers to her blog, and she is extremely popular in the cooking world. Saute shrimp over medium-high heat in 1 tbsp butter and olive oil for about 2 minutes, or until opaque. Remove shrimp and saute onion and garlic in remaining 1 tbsp butter and olive oil over medium heat for about 3 minutes, or until onion is translucent. Add tomato sauce and heavy cream and stir until combined. Add herbs and cooked, drained pasta. Sprinkle with salt and pepper. Serve and garnish with Parmesan cheese, if desired. Bring pot of water to a boil. Cook the penne until al dente (firm yet tender). Drain and set aside. Begin by peeling and deveining shrimp and rising them under cold water. In a small skillet over medium-heat, add 1 tablespoon of butter and 1 tablespoon of olive oil. When the pan is hot, add the shrimp. Stir and cook on both sides until it is just starting to turn opaque, about 2 minutes. Remove to a plate and allow to cool slightly. In a large skillet over medium heat, add the remaining butter and olive oil. Add the garlic and onion. Stir to combine and cook, stirring occasionally, until the onion is translucent, about 3 minutes. If using wine, pour into pan and allow to evaporate, about 45 seconds. Pour in the tomato sauce and stir to combine. Reduce the heat to low. Pour in the cream. Stir well to combine; reduce heat to simmer. Add the shrimp to the sauce and stir gently to combine. Next add the herbs and cooked, drained pasta. Stir gently to coat. If the sauce is too thick, add a little milk to get it to the right consistency. Add salt and pepper. Serve. One Response to "Penne alla Betsy"